As Gandhi once said, if we perform repeated reactionary responses, it disempowers us. Perhaps this is why the Happy Too Asian conference was organized—to create a space for people to be proactive rather than be reactive. Two years after the “Too Asian?” article ran in Macleans magazine, SCAAAR (Solidarity Committee Against Anti-Asian Racism) created a space to celebrate activism against racism in the media. The emerging theme from the conference was the role of media in the traditional union between race and law. We live in this age of constant, up-to-the-minute media. Moreover, increasing number of us are using social media to rally behind an issue, or to simply communicate media stories to our friends. So it is important that we use these tools to challenge conventional media, and hold them accountable for discrimination. Furthermore, media can become a platform on where we can have a respectful conversation about these “taboo” issues. Because the only way we can move forward is if we rise above our fears and have a much-needed conversation. According to Tetsuro it just takes two steps: Come up with an idea that scares you, then document it. A great example that follows this recipe? Dr. Ray Hsu’s UBC creative writing class giving “a collective “F” you to Macleans” through a music video. Come on, try to watch that and tell me that you aren’t chuckling at the ridiculous Asian stereotype that pops up beside faces of people belting out Michel Jackson’s “We are the World”. This video is gold. And it all it took was a bold idea, deep-fried in courage and seasoned with humour. Speaking out isn’t easy, but it is worthwhile. Morning keynote speaker, Jan Wong, shared her powerful story of dealing with workplace depression, which was triggered by an incident in which she become a victim of racism following her controversial column in the Globe and Mail. In 2006, Wong was a reporter for the Globe and Mail and she wrote a piece about the Dawson College shooting, suggesting that the Quebec school shootings could be linked to the province’s “decades-long linguistic struggle”. Following the publication of that article, Wong was a victim of hate-crimes and racist and sexist attacks. 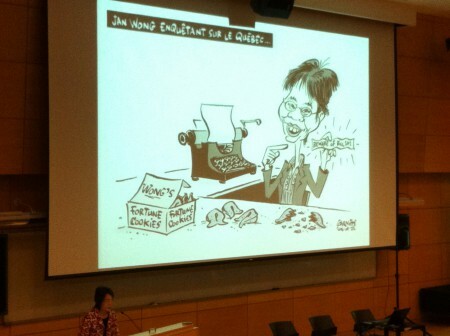 At Happy Too Asian, Wong shared some of the offensive cartoons that were published in newspapers in 2006. 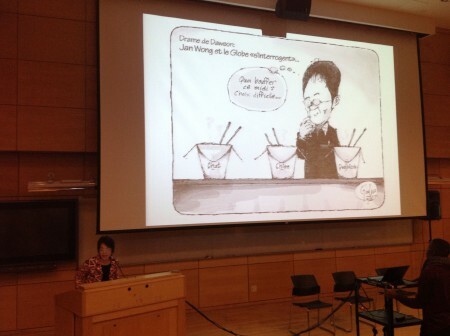 Wong asked the audience: “Why am I always linked to Chinese food?”. She lamented how frustrating it is that society cannot let her journalist reporting sever ties with her racial identity. Wong pursued legal action and since has detailed this experience in her memoir, Out of the Blue. Ironically, Wong’s Out of the Blue was on the Globe’s Best Seller List. By sharing her experiences publicly, Wong has inspired people to stop being submissive to racism. Tetsuro was asked a provocative question from the audience: what he would have done had he been in Wong’s position. The infamous Macleans article provoked people to unite against racism. It started a national dialogue about overt racism in the media and how Canadians were shy to recognize racism. Two years later, Canadians are no longer afraid to talk about race. We realize that talking about race is only way to deepen our intercultural understanding, and ultimately create a robust community. *If you are wondering why Tetsuro looks like Mount Rushmore, it’s because he is kind of like some higher-power being to us Azns. Shigematsu was the first person of colour to host a daily national radio program in Canada for the CBC, he is a YouTube sensation (RE: Shiggy TV), and he is a provocative columnist for the Huffington Post. But on the real, he is the size of a Mount Rushmore Face because the conference happened in Vancouver & Toronto and I was in TO when Tetsuro Skyped-in from Van. **If you are doing this IRL, obviously be smart and hide IP addresses and all that jazz.